As TV manufacturers and broadcasters gear up to deliver 4K video to people's living rooms, there still aren't many options for regular folk who want to shoot super high resolution footage of their own. Sony wants to lead that charge with a new camcorder that will make 4K simple, manageable, and most of all (relatively) affordable. With, of course, some compromises. The FDR-AX1 4K Handycam is the realization of the concept shell we saw at CES 2012. It's a camcorder aimed at casual shooters, wedding, and corporate videographers alike. While 4K recording is already available at the higher end with Sony's F55 and F5—both costing well over $10,000—the AX1 is the company's first attempt at targeting consumers who want advanced features in a small, ready-to-shoot package. That package is a $4500 non-interchangeable lens camera with a small 1/2.3" sensor, which means it won't provide the kind of image that most modern filmmakers seek, one with shallow depth-of-field and a variety of lenses to choose from. The AX1 looks almost identical to the HDR-AX2000, now a couple of years old. It features an f/1.6-3.4 OSS G lens with a 20x optical zoom, with 35mm equivalent focal-range of 31.5-630mm. The AX1 records at a maximum resolution of 3840 x 2160 in 60p (also 24p, 30p, 25p, and 50p). The footage is encoded with Sony's XAVC S codec, which is basically what makes this camera possible. 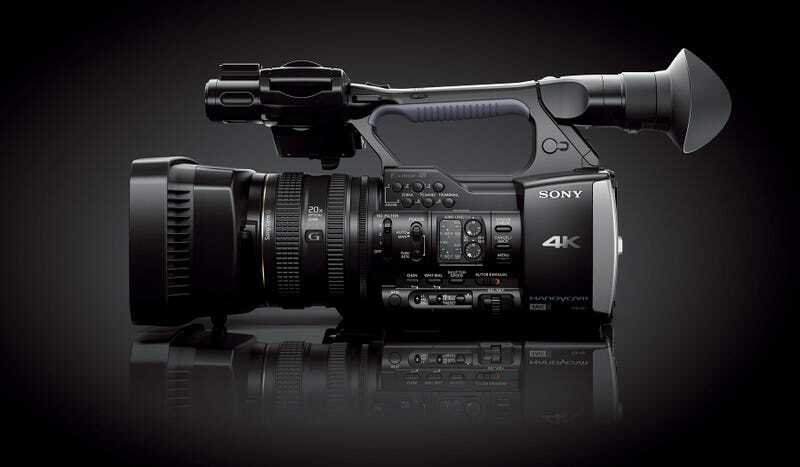 XAVC S is a new version of XAVC, used in Sony's higher-end F5 and F55. XAVC S footage is encoded in 3 possible data rates—60, 100, or 150 Mb/s. That sounds high compared to AVCHD data rates of 25 Mb/s, but for the huge amounts of data in 4K video, even 150 Mb/s is highly compressed. This means the possibility of footage with ugly digital artifacts. The whole point of such high compression is so the footage can be stored on small XQD memory cards as opposed to bulky SSDs or expensive SxS cards. Regular high-speed SD cards can be used as well, but will probably only work at lower bit-rates, or when shooting in HD resolutions. The downside of this new codec, beyond the super-high compression, is that you will only be able to edit it on Sony Vegas software. It will take time for the likes of Apple and Adobe to develop support for the codec in Final Cut Pro and Adobe Premiere. Beyond 4K recording, the AX1 has all you would expect to find in a prosumer camcorder; XLR inputs, neutral-density filters, the classic form-factor that has been the mainstay if this product category for almost 2 decades. While most budget filmmakers are likely to opt for DSLRs or cinema cameras with larger sensors, the compression technology at work here is likely to eventually find its way into those types of cameras down the line, the same way AVCHD did. Sony's strategy with the AX1 isn't to wow the artsy indy filmmaker crowd. It can't do that with a camera that screams last-decade. Its goal is to establish itself as the first company to take 4K to consumers, with their XAVC S codec driving the train.